Marianna Ritchey at the opera. Image courtesy of Marianna Ritchey. On July 26, I attended The (R)evolution of Steve Jobs, a new opera by Mason Bates. (R)evolution was co-commissioned and co-produced by the San Francisco Opera and the Seattle Opera, institutions with a history of commissioning new works. The 40-year old Bates began taking the world of classical music by storm in 2004, when he won a Rome Prize while hardly out of Juilliard. Since then, the accolades, prestigious commissions, and residencies have piled up, and he has accrued an astonishing roster of high-profile supporters, including Riccardo Muti, Michael Tilson Thomas, and Marin Alsop. The secret to Bates’s success is his incorporation of certain signifiers of techno music (drum machine, laptop triggers) into orchestral composition. His supporters maintain that Bates’s use of technology and cool techno beats will bring in audiences younger than those classical music usually attracts in the U.S. This notion--that Bates’s music will bring out the elusive young audiences--has often been uncritically embraced, regardless of whether or not it has been proven true. The show began ‪at 8:30, just as the sun was setting over Los Alamos. I pondered the unintended resonances generated by the location—here we were, about to musically glorify the explosive innovations of a—by multiple accounts—dreadful man in the very spot where the atom bomb was invented. The sun lit up the six large moveable screens that comprised most of the opera’s set, on which various images and videos were projected; the screens themselves gleamed like new iPhones in the sun’s dying rays. (R)evolution takes place in one extended act of 20 scenes, most of them very short; consequently, the screens were almost constantly in motion, manipulated by six blue-clad technicians, who took the first bows of the evening. The opera tells a familiar story: the hero is a genius but also a horrible jerk, who is ultimately redeemed by the patient (if inexplicable) support of a good woman. In this case, the woman is Jobs’s wife, Laurene, who, in Bates’s words, “convinces Jobs of the importance of true human connection.” The potential problem this neat narrative arc causes, given that it bears little resemblance to Jobs’s real life, is perhaps intended to be mitigated by a note at the beginning of the program saying the opera does not depict actual events. Bates and librettist Mark Campbell emphasized in interviews and program notes that they were interested in the idea that Jobs “revolutionized human communication” despite being a “tyrant” in his personal life. The storyline thus naively juxtaposes Jobs’s “great works” against his terrible personal behavior, as though we are supposed to be amazed by the revelation that a person can be both gifted and cruel. Additionally, by depicting a personal redemption that doesn’t seem to have occurred in Jobs’s actual life, the opera’s creators worked to smooth over any ambivalence we might feel about Jobs due to his famous brutality and selfishness. It’s hard not to experience this cultish fiction as an advertisement for Apple, one that reassures us that continuing to purchase its corporate products is justified by the inspiring personal life journey of its founder and visionary. In (R)evolution, Jobs creates the Mac and the iPhone (good), but he yells at his employees and coldly tells his pregnant girlfriend to get an abortion (bad). Throughout, he is visited by Kōbun Chino Otogawa, a Japanese Buddhist priest who tells him constantly to “simplify”—advice that Jobs applies not to his life, but to hardware design and branding. The opera often underscores the relationship between Apple’s famously minimal look and Japanese aesthetics: we see Jobs have an epiphany in a Japanese calligraphy class at Reed College, for example. 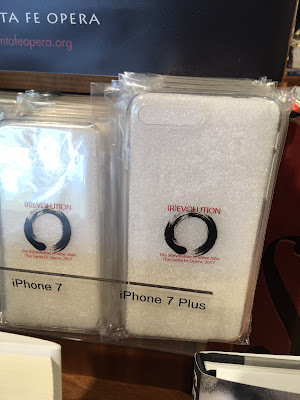 And, since its creators were denied the use of the famous Apple logo, (R)evolution substitutes the Japanese calligraphic ensō, a circle drawn with a single brush stroke (this logo is printed on iPhone cases you can purchase in the opera’s gift shop). The ensō also serves as a metaphor for the narrative structure of the opera, which opens and closes with the same scene: Young Steve being given a workbench by his father. The association of Zen practice and aesthetics with Apple products also felt like an advertisement; since these products were inspired by Buddhist principles, perhaps purchasing them will enable consumers to find enlightenment. iPhone cases for sale. Photo Courtesy of Marianna Ritchey. The opera treats the 2007 unveiling of the iPhone as one of the pivotal moments in Jobs’s life, returning to it again and again thanks to the non-chronological, repetitive storyline. Here we first meet Adult Steve (Edward Parks), who comes striding out from behind the whizzing screens, clad in his characteristic light-colored 90s jeans, black turtleneck, and sneakers. The first thing he does is tell the assembled tech crowd to turn off their phones (this was one of many lines that drew big laughs). The first number, “One Device,” details all the things the iPhone allows us to do (“Play a game/Send a card/Mend a heart/Buy a tie/Learn some Thai/Order Thai”). These lines are illustrated with images projected onto the screens (family photos, apps, emoji), interspersed with the recurrent image of a huge iPhone floating elegantly in black space. As the number builds to a climax, the chorus assembles behind Jobs, making exaggerated swiping and tapping gestures as they sing “Swipe! Tap!” This kind of “on the nose” literalness is common throughout the opera—later, for example, when Apple’s board pressures Jobs to quit, we see a montage of projections showing plummeting stock prices and the words “SYSTEM ERROR” while Jobs puts his hands to his forehead and staggers dramatically. Musically, the opera is based on Bates’s characteristic lightning-quick, sprightly motivic repetition, with sections of antiphonal brass for dramatic moments. His vocal writing is creditable—in particular, arias for Laurene and Kōbun are sometimes quite lovely (this was helped by the sensitive performances of Sasha Cooke and Wei Wu, who were excellent). As for Bates’s famous engagement with techno, I would argue that it is never more than minimal, in this (or any) of his music. Woven into the orchestral texture are periodic electronic noises—beeps, whooshing sounds, and gentle clicks—and every once in awhile he breaks into a relatively driving four-on-the-floor beat. Only someone who had never heard of ‪Skrillex or DJ Snake could maintain that Bates’s music comes from the world of techno, or that it is even mildly techno-adjacent. Rather, he simply overlays idiomatic orchestral writing with a mild pastiche of electronic music signifiers. This enables him to appear edgy to classical music institutions and critics, but I question whether any actual young people—those to whom Bates is supposed to automatically appeal due to his use of the drum machine—are compelled by it. Bates relies often on pastiche, and not just when he is deploying techno signifiers. His musical characterization of Kōbun, for example, is an assortment of orientalist clichés: breathy pentatonic flute, gongs, and prayer bowls, which Bates, mixing religious traditions, says “float across the electronics as if in a nirvana-esque limbo.” When the libretto draws the standard comparison of music to math via J.S. Bach (“the composer!” Jobs explains), Bates quotes a bit from the first prelude and fugue in The Well-Tempered Clavier. Similarly, when bad things happen in the narrative, Bates characterizes them with self-consciously “modernist” idioms (dissonant strings, atonal brass blasts). In his program notes, he writes that he created “unique soundworlds” for every character in the opera, and that these soundworlds “explode the concept of Wagnerian leitmotifs.” I confess I did not hear anything this grand; while there were motives recognizably associated with particular characters, it was more like a rudimentary film score than an "explosion" of anything Wagnerian. One of the opera’s central plotlines is Jobs’s transformation from what Bates describes as “an idealistic hippie” to the corporate mega-titan he soon became. (R)evolution depicts the 1973 origins of Apple: in the humble garage of his family home, Jobs and his friend Steve Wozniak use their technological ingenuity to subvert the phone company’s long distance fees and prank-call the Vatican. They then exult in their toppling of the corporate behemoth via a jazzy duet: “Ma Bell was just taken down. Ma Bell was just screwed over. Ma Bell was just brought to her money-sucking, monolithic, monopolistic, autocratic knees!” These origins were important to Apple’s early devotees as well as to its initial self-branding as an anti-establishment anti-corporation. This branding obviously does not accord with what Apple has become: a multinational corporation with 116,000 global employees and a yearly revenue of hundreds of billions of dollars, much of it held in international tax shelters. (R)evolution glosses this transformation: in a scene set in 1981, we see Jobs screaming at his employees, firing people unilaterally, and refusing to acknowledge his child. Wozniak sings a melancholy aria before quitting the company: “You’ve become one of the bastards we hated: an egomaniacal, self-centered, self-serving, self-deceived, mega-corporate prick!” However, the opera swiftly repairs any distaste for Jobs this scene might engender, by suggesting that late in his life Jobs returned to his authentic roots and became enlightened, thanks to his love for Laurene and to the patient guidance of Kōbun. The opera concludes with a comical scene in which an enlightened Jobs, in ghost form, nit-picks the design of his own memorial service, like a George Bailey who doesn’t really mind being dead. Left alone onstage, Laurene sings a final aria in which she begs the audience to stop looking at their phones all the time, saying it’s not what Steve would have wanted (“He’d say ‘please, buy them, but don’t spend your lives on them.’”). This seems unlikely. More disheartening to me, however, is the opera’s failure to engage with the actual complexity of Jobs’s legacy. As the above synopsis suggests, the opera substitutes a personal journey in place of a corporate history; Bates and Campbell said they wanted to show “the good and bad” of Jobs’s “influence on our culture,” but in reality the opera only explores the good and bad sides of Jobs’s character. I found this elision of the global into the personal disturbing; Bates and Campbell seem primarily concerned by the fact that our iPhones were invented by a man who was cruel to his loved ones, which is certainly bad but hardly indicative of Jobs’s influence on “our culture.” When I think of Jobs’s and Apple’s influence on the world, I think of the fact that our iPhones, tablets, and laptops are assembled in overseas factories plagued by human rights violations, or that they are constructed using minerals mined by slave labor, or that they enable the exploitative labor formations of subcontracting and the gig economy, or that the planned obsolescence Apple plays a part in enforcing contributes to the ruination of our environment. Instead of engaging with any of these effects Apple’s products have had on the world, the opera’s creators implied that the “bad” side of Jobs’s legacy is simply the bad use of those products by individual consumers, who spend too much time on Facebook. The night I saw it, the concluding crescendo was answered by a huge roar of approval from the crowd, many of whom gave a standing ovation. 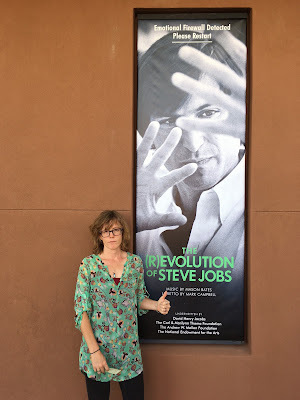 Despite its moral vacuity, its clichéd, fraudulent narrative arc, and its middling music—and although critical reviews have been mixed—there is no doubt that The (R)evolution of Steve Jobs will go down as a success; its six performances are sold out, and the SFO might add a seventh. I personally left the performance totally enervated and depressed, and that night I had a nightmare in which I was giving a lecture about how the shark in Jaws represents capitalism. However, for those who yearn for “classical music” (broadly considered) to find market success regardless of what that music actually sounds like or the kinds of stories it is used to tell, the success of this work will almost certainly represent a positive phenomenon. 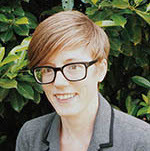 Marianna Ritchey is an Assistant Professor of Music History at the University of Massachusetts, Amherst. She writes about Berlioz, French fantastic literature, and economics and contemporary classical music; she is currently finishing a book manuscript that examines the dynamic between classical music and capitalist logic in the contemporary U.S. She is also the co-founder of the Musicology and the Present conference series. ‪Mason Bates, “The Music of Communication,” and Mark Campbell, “The Evolution of (R)evolution,” Program notes for The (R)evolution of Steve Jobs, The Santa Fe Opera, Kevin Newbury, Santa Fe Opera House, 2017 season. It is obviously difficult to obtain solid data concerning the age of audience members, which is part of the reason this rhetoric about Bates is so easily perpetuated and so difficult to counter; however, I can report my non-empirical observation, which was that at the performance I attended, there were very few audience members who looked like they were under 50. I do not intend this observation as an insult toward older people who attend operas or classical music concerts--as many have noted, the “greying audience” trope that characterizes the debate about classical music’s ongoing demise is ageist and rude--but since so much of Bates’s success is predicated on the assumption that he brings young people into the concert hall, I think his audience demographics are worth questioning. Certain conventional approaches to film composition are themselves indebted to the basic idea of leitmotivs. Scott Paulin has demonstrated that early practitioners of film music took for granted that film accompaniment should be “Wagnerian,” for example, although he also argues that such practitioners deployed leitmotivic composition only to the extent of establishing character themes, rather than developing the kind of motivic “synthesis” and “cohesion” that, for Wagner, was what was actually compelling about composing in this way. Thus, “to the extent that film music is or has been Wagnerian, it has largely been as a sort of wish fulfillment.” I would argue a similar sort of wish fulfillment is at work in Bates’s assertions about “exploding” Wagner’s model. “Richard Wagner and the Fantasy of Cinematic Unity: The Idea of the Gesamtkunstwerk in the History and Theory of Film Music,” in Music and Cinema, eds. James Buhler, Caryl Flinn, and David Neumeyer (Hanover: Wesleyan University Press, 2000), 58-84. See for example Anne Midgette’s review, in which she acknowledges that the opera was “tedious,” “disappointing” and “canned,” but nonetheless says that the audience’s rapturous response to it makes her hope (R)evolution will continue to be performed. “Steve Jobs Opera Proves Tedious--And A Triumph,” Washington Post (July 23, 2017). Very convincing. I, too, hate this relatively recent trend of critics cheering for every new piece, no matter how flawed, as a way of encouraging new music in general. It will do us no good in the long term.